Blue Painters Tape Clean Release Trim Edge Finishing Masking Tape (1''x165',12 Rolls) by Tiger-Hoo at Designers Artists. MPN: THBMT. Hurry! Limited time offer. Offer valid only while supplies last. 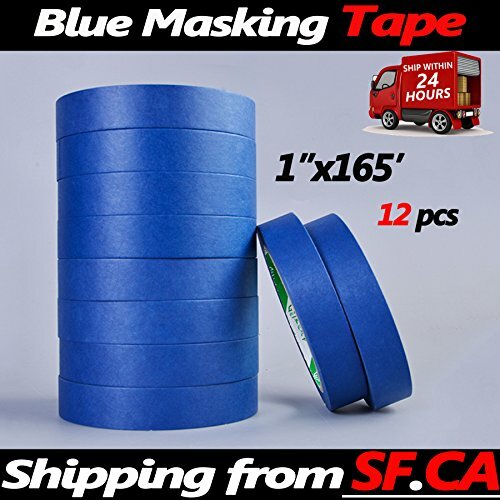 Blue Painters Tape Clean Release Trim Edge Finishing Masking Tape Width: 1 in. Length: 165ft Quantity: 12 rolls SPECIAL PRICE ON LARGE ORDERS. SPECIAL PRICE ON LARGE ORDERS. All items must be returned in its original packaging. Buyer is responsible for all shipping fees on returns. Original shipping cost involved in shipping to customer is not refundable. Factory Direct， More Offers; Buy More, Save More. View More In Rolled Canvas. If you have any questions about this product by Tiger-Hoo, contact us by completing and submitting the form below. If you are looking for a specif part number, please include it with your message.